Real Madrid legend Alfredo Di Stefano has passed on, at the age of 88. The Argentina-born forward suffered a heart attack on Saturday and had been in an induced coma in Madridâ€™s Gregorio Maranon hospital. Spanish giants Real confirmed the news, saying Di Stefano, their honorary president, died at 1715 CET (4:15 Nigerian time). The forward won five straight European Cups, scoring in each final between 1956 and 1960. 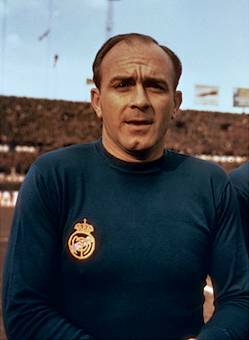 Regarded as one of the most influential football icons of all-time, Di Stefano won eight Spanish league titles and was voted European player of the year in 1957 and 1959. He quit â€˜Los Blancosâ€™ in 1964 at the age of 38, after scoring more than 300 goals in 11 seasons. â€œMyself and the Real Madrid board like to express our deepest condolences, all our love and affection ton Di Stefanoâ€™s children, families and friends,â€ the reigning European champions president Florentino Perez said. Di Stefano featured for three nations, namely: Argentina, Colombia and Spain, at international level, but never at the World Cup. He won six and four caps- unofficial by Fifa- for Argentina and Colombia respectively during a spell in the countryâ€™s league. Di Stefano eventually won 31 Spanish caps, scoring 23 goals for Spain, after Fifa had reversed its initial decision (in 1954) to stop him from featuring for the â€˜La Rojaâ€™ in 1957.